In most restaurants, it’s the appetizers, not the main courses, that feature the most innovative cuisine. Appetizers are not burdened with the responsibility of nourishing diners–they simply give them an interesting gastronomic pitstop before the main course; the former meal holds the promise of exciting, albeit somewhat ephemeral cuisine, the latter of predictable, lasting nourishment. If a diner doesn’t like the parmesan-cheese-infused broccoli rabe foam, it’s no big deal–the lasagna will surely satisfy. I used to look askance at the pied-à-terre–a variety of housing usually owned by rich folks whose actual homes are huge things in the burbs or Provence or Dubai or Shangri-La. While this assumption might be true in many instances, pied-à-terres serve a very important role: they are the appetizers of the architectural world. Architects take chances with pied-a-terres in ways they don’t with primary residences. And because rich folks usually own them, pied-à-terres get innovative (i.e. expensive) features and luxe finishes you don’t see in most plebeian homes. And like appetizers, pied-a-terres tend to be small portioned. 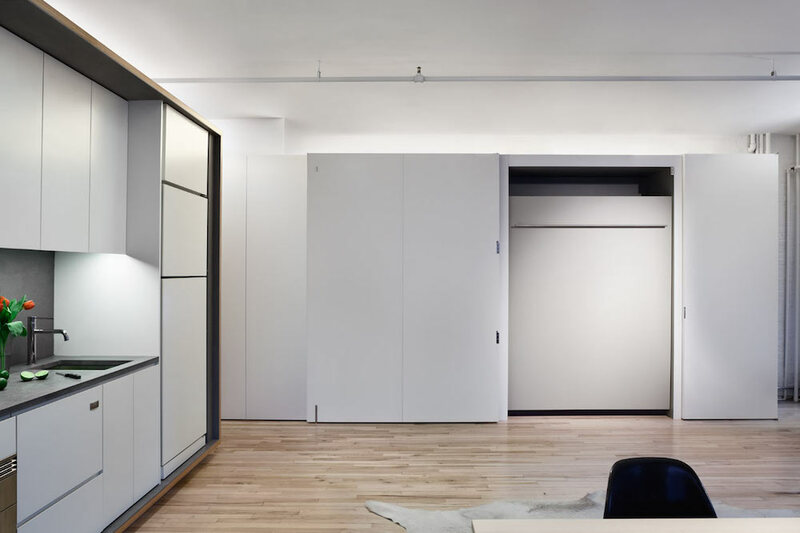 This pied-à-terre loft by LYNCH / EISINGER / DESIGN in Manhattan’s Tribeca neighborhood is a nice example of my theory (and it is just a theory). 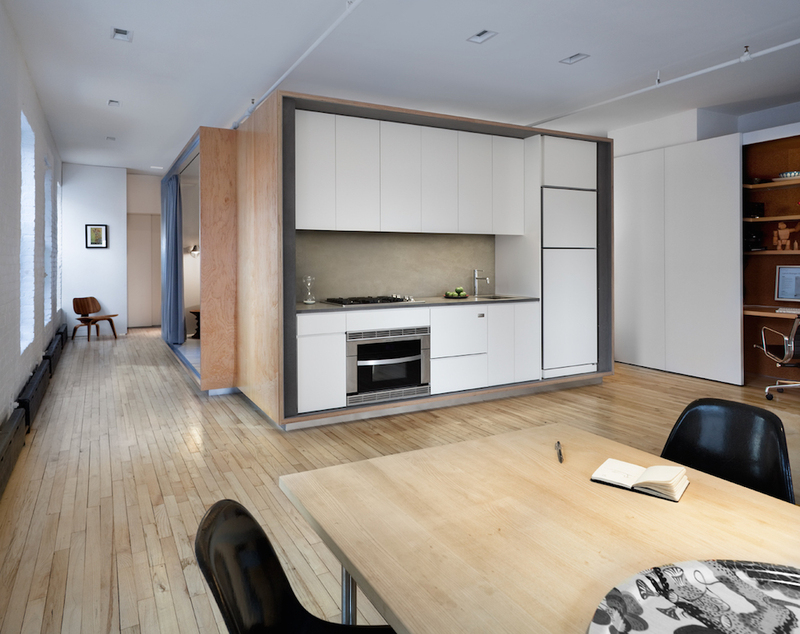 At 900 sq ft for one person (a student no less), it isn’t small, but we think it’s filled with some interesting ideas and it is certainly beautifully executed. The space revolves around a large wood volume that houses the kitchen, one bathroom, a ton of storage and a sleeping area. Because the space is typically occupied by one person, the bed has a big opening to face the lofts ample bank of windows. But a large curtain allows the bedroom to be shut off from the rest of the space if there are guests or the owner needs some dark. In the living room is another bank of tall cabinetry that houses a desk, more storage and a wall bed for guests. The rest of the area is kept open for normal furniture and retains some of the loft’s industrial character. Great place but I think that 900 sq ft for 1 person is a lot of space. That’s almost as large as the home I grew up in and we had 5 people living in it. 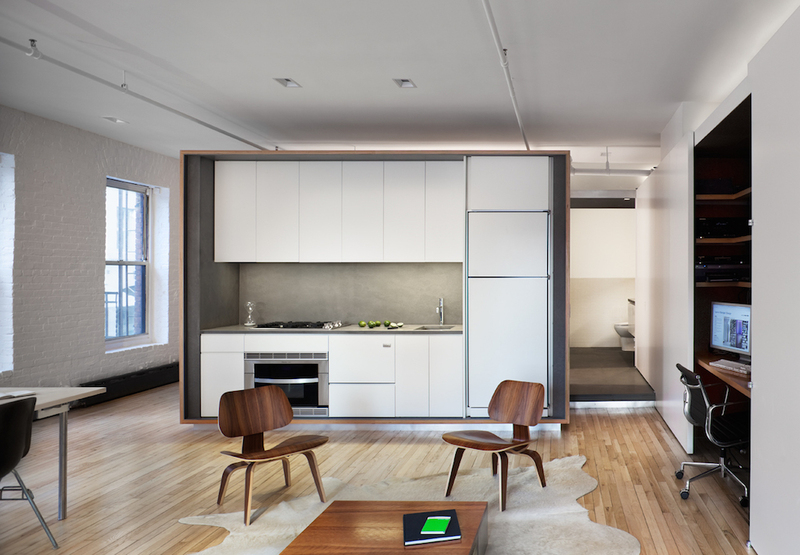 I tend to agree — 900 sq ft is quite generous for one person however this is incredibly well done…nice use of space and with a little tweak here and there the layout could probably be replicated in a much smaller footprint.